Gof Gunthan is a traditional Navratri Garba Dance and it has a history of more than 300 years. The dance is performed annually during Sharada Navratri (September – October). Gof Gunthan is a popular dance form of Koli and Kanbi community in Saurashtra and is a variation of Dandiya Raas. In the dance, each dancer holds a stick in one hand and a string in the other. The string is tied with a ring hung from the ceiling. The string is an important part of the dance. 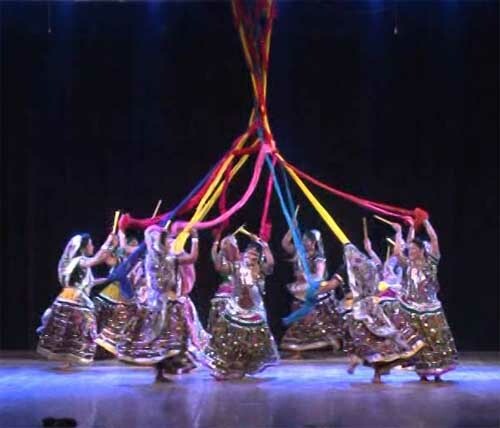 The dancers perform various raas such as fundadi, tappa and bethak and they then weave a braid using the string. The braid is then unweave. The dance includes the striking of the stick. Traditional musical instruments like harmonium, tabla, dhol and manijra are used to create the desired music for the dance.